This week's edition includes a detailed recap of the Prior Lake homecoming win against Eagan, a preview of the gigantic contest at Lakeville North and the story behind the first Blue Collar Bowl. 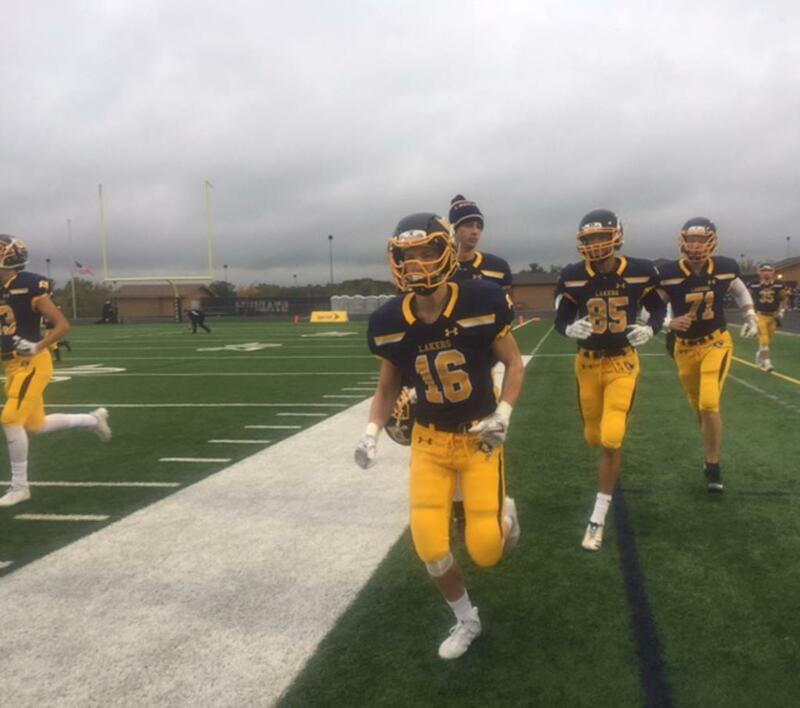 The Prior Lake offense scored 26 first half points and the defense only allowed an opening drive field goal as the Lakers (3-3) cruised to a 44-3 homecoming win Oct. 6 against Eagan at Dan Patch Stadium. The Wildcats got the ball first and put themselves in position for a touchdown early following a 50-yard third down carry by running back Eisley Nkwonta but the Laker defense stood tall and held Eagan to a field goal, the Wildcats only points of the game. The Lakers used the momentum of the defensive stop on the ensuing kickoff when returner Keaton Schroeder fielded the ball around his own 15-yard line and returned it all the way to the Eagan 17. Two plays later running back Preston Jelen scored on a toss play from 15 yards out, beating the Eagan defense to the pylon and giving Prior Lake a 6-3 lead just 3 minutes in. Running back Jordan Johnson was stopped short of the goal line on the two-point conversion attempt. The Laker defense forced a fumble on the next Wildcat possession which was recovered by linebacker/running back Spencer Shaver. However, Shaver fumbled the ball back to Eagan a couple plays later while in on offense. When the Lakers got the ball back, they were aided by three long runs in a row, the last of which was a 19-yard run by Shaver when he went untouched into the end zone thanks to great blocking by the offensive line. The score was 12-3 with 1:39 left in the opening quarter after Jelen’s pass fell incomplete on the two-point conversion. Following another stop by the Laker defense, Prior Lake started the second quarter with a bang as Jelen broke through the middle of the Wildcat defense for a 40-yard run, not getting taken down until the 5-yard line. Shaver scored a couple plays later to increase the lead to 18-3 with 10:05 left in the half. The conversion attempt was not successful. The defense then forced a three-and-out, giving the ball right back to the Laker offense, who had a short field at the Eagan 41-yard line after a good return by Dylan Bair. Jelen had a big run two plays later on a similar carry to his earlier touchdown, taking the ball inside the 10-yard line. Johnson scored a few plays later from 3-yards out and Jelen found running back Nathan Herber in the end zone for the two-point conversion making it 26-3 Lakers, which was ultimately the score at the half. “We were able to get momentum early and sustain that momentum throughout the entire game,” Gegenheimer said. The Wildcats tried a squib kick to start the second half but it was scooped up and returned by linebacker Noah Benson who took the ball all the way to the opposing 36-yard line. Eagan was able to stop the Laker offense but a great punt by punter Blake Ochsendorf pinned the Wildcats at their own 1-yard line. The Prior Lake defense tackled running back Antwann McClenty in his own end zone for the safety, making it 28-3 Lakers. Schroeder delivered the dagger on the following kickoff, scooping up the ball around his own 40-yard line and returning it all the way for a touchdown. Jelen ran in the two-point conversion to make the score 36-3 with 8:47 left in third quarter, essentially putting the game out of reach. Running back Carter Johnson scored the final Laker touchdown in the fourth quarter on a 28-yard run and wide receiver Spencer Marlier ran in the two-point conversion to reach the final score of 44-3. The big lead in the second half allowed Gegenheimer and the coaching staff to play a variety of players, many of whom usually play JV or are on the scout team and don’t normally get a ton of snaps on Friday nights. Linebacker Zach Wick and lineman Zach Whaley led the Prior Lake defense in tackles with 8 and 6 respectively. Offensively, the Lakers finished with 293 rushing yards as a team. Jelen led the Laker ground attack with 123 yards on just 9 carries. Jelen, Johnson and Shaver have now each had a 100-yard rushing game and Gegenheimer thinks that will help his team moving forward. Calling the Oct.13 matchup with Lakeville North the biggest game of the year could be an understatement, not only because of the rivalry between the two teams but what a win would mean for both programs’ long term goals. The game itself has major district and playoff implications, with the winner remaining in contention for the regular season Metro South district championship as well as a potential top seed when the 31-team playoff bracket is released next week. The Panthers (4-2), currently ranked 9th in the AP poll, are coming off a 14-6 loss last week to 7th-ranked Maple Grove. The Panthers had a chance to tie the game on a drive in the final minute but were stopped on a fourth down at the Maple Grove 12-yard line. Prior to their loss to Maple Grove, Lakeville North had won three straight games over Wayzata 24-7, Lakeville South 28-0 and Farmington 51-0. The Panthers’ other loss was to top-ranked Eden Prairie 41-13 in Week 2 following a 62-0 drubbing of Burnsville in their opening game of the season. Lakeville North Quarterback Brennan Kuebler currently ranks 4th in the Metro South in passing yards with 433 and has 47 completions on 90 attempts with seven touchdowns and five interceptions. Kuebler’s status for the game is unknown however as he appeared to be injured in the fourth quarter against Maple Grove and did not return. Wide receiver Owen Blascziek is Kuebler’s top target with 19 catches and 251 receiving yards to go with four touchdowns. The Panther rushing attack is led by two running backs, Brian Curtis Jr. and Ryan Dalrymple. Curtis has 345 yards on 70 carries and four touchdowns while Dalrymple has 222 yards on 59 carries and three touchdowns. The rivalry goes back to 2011 when Lakeville North beat Prior Lake in the regular season finale to claim the South Suburban Conference title at Dan Patch Stadium. The two teams met in 2012 when the Lakers memorably defeated Lakeville North 10-6 on the Panthers’ homecoming with the two teams sharing the conference championship. They matched up again in the state quarterfinals that season in the Metrodome where the Panthers got revenge with a 23-3 victory, ending the Lakers’ season. The Lakers and Panthers last met in 2014, a 10-7 Laker win at Lakeville North High School. The Prior Lake coaching staff will be wearing work shirts for the occasion and fans and students are encouraged to wear their own blue collar outfits. Kickoff at Lakeville North on Friday is scheduled for 7 p.m.
Be sure to check back next week for a recap of the Lakeville North game, a preview of the Week 8 matchup against Eastview and a detailed outline of the playoff seeding process. Reminder: Next week’s game at Eastview will be on Wednesday due to MEA break.